Ray Henders, tenor, Howard Tweddle, lead, David Boo, bass, Darryl Cremer, baritone. The Chicago Shuffle, 2002 Seniors' Gold Medal Champs, are anything but what their name implies. Their snappy repartee and dynamic singing performance will leave you with no doubt in mind that they are champions in every sense of the word! The four men comprising this fine singing quartet have a total of almost 150 years of barbershop singing experience between them. Lead Howard Tweedle has been singing in quartets since his teens, Bari Darryl Creamer has been active as both quartet singer and emcee in the Illinois and Land O'Lakes District for years; Dave Boo, the youngest of the four has sung his basso profundo in many excellent quartets; and Ray Henders, tenor, has been in three other Senior championship quartets and tenor in the 1981 SPEBSQA Champs, The Chicago News. 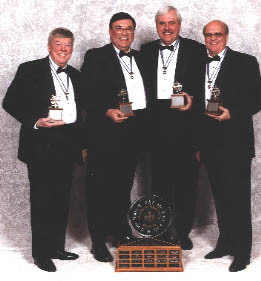 All four men are members of the Great American Chorus of Gurnee, Illinois. We know that you will enjoy CHICAGO SHUFFLE!